Extremely cold hardy, even in harsh winter climates. Plants die back to the ground in winter and re-emerge in spring. Echinacea, Catnip, Agastache and Dill. Often planted with low, mound-forming herbs and flowers. Valerian can stand 1.5 m (5ft) tall when it is in full bloom. Start with a purchased plant, or start seeds indoors and set out seedlings two to four weeks before your last frost. After two years, valerian will grow into a 18" (45 cm) wide clump. 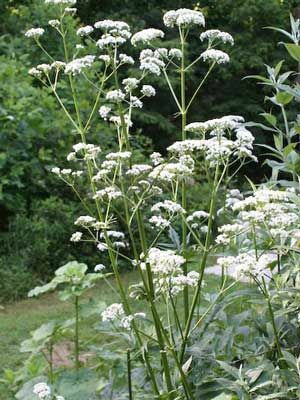 Valerian produces extremely fragrant flowers in early summer. Gather them for use as cut flowers to keep valerian from reseeding and becoming invasive. Dig roots in fall or early spring and dry outdoors, because they release an unpleasant smell as they dry. Store in airtight container. Dried valerian roots are used to make a bedtime tea that promotes sleep. They are also much loved by cats and dogs. Control valerian's spread by cutting back flowering stems before they can shed seeds in your garden.